Yellow rails are a secretive, wetland species, breeding in the northern United States and Canada, with a disjunct population in Oregon. The yellow rail breeds very locally within this range and is probably naturally ephemeral in distribution in response to annual and seasonal variation in water levels. The species winters in the southeastern United States, primarily in coastal areas. The secretive nature of the yellow rail makes it difficult to determine its distribution and abundance. Recent surveys have documented yellow rails in numerous counties in north-central and northwestern Minnesota, indicating that this species is somewhat more widespread in suitable habitat than previously believed. However, yellow rails have very narrow habitat requirements, and even slight changes in water levels in wetlands can render habitat unsuitable. Consequently, the species and its habitat are extremely sensitive to drainage, impoundments, and other disturbance and habitat conversion activities. 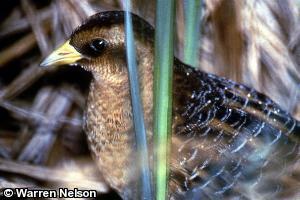 For these reasons, the yellow rail was listed as a special concern species in Minnesota in 1984. Averaging only 15-18 cm (6-7 in.) in length, this small rail is one of Minnesota's most elusive birds. It is most often detected by the 'ticking' call it makes, primarily at night. Shy and secretive, the yellow rail is extremely hard to see even once it has been detected by its call. Its short bill, buffy yellow underparts, and darker buffy striped back are the primary identifying features that distinguish this species from other rails. If yellow rails are observed in flight, white patches visible on the trailing edge of each wing are diagnostic. However, because they prefer to run rather than fly from an intruder, they are rarely seen in flight. Yellow rails breed in sedge- or grass-dominated wetlands, particularly wet prairie and rich fens with narrow-leaved sedges, such as fen wiregrass sedge (Carex lasiocarpa ssp. americana), and wet meadows with wide-leaved sedges and grasses, such as lake sedge (C. lacustris) and bluejoint grass (Calamagrostis canadensis) (Bookhout 1995). Within these habitats, water depths from 2-25 cm (1-10 in.) are optimal. Appropriate water depths are critical to yellow rails during the breeding season. Sites with ideal vegetation structure but unsuitable water conditions (either too wet or too dry) are unlikely to contain yellow rails. However, these same sites may be utilized by yellow rails during other years when water levels are more favorable. A litter layer of dead, procumbent sedge or grass, under which yellow rails move, is also important. The invasion of woody species into wetlands diminishes the habitat quality for yellow rails (Bookhout 1995). The yellow rail winters in coastal marshes in the southeastern United States. It is present in its breeding habitat from April through September. Males establish breeding territories averaging 7.8 ha (19.3 ac.) in extent, and females use smaller feeding areas. Nests of multiple females have been found in a single male territory (Bookhout and Stenzel 1987). Nests are built on the ground or on tussocks. Females lay from 5-10 (typically 8-10) pinkish eggs in late May through early June. The eggs hatch after 16-18 days, and the young, which are semi-precocial, fledge after about 35 days. The yellow rail feeds mainly on small snails, aquatic insects, and seeds. Loss of wetland habitat is the most serious threat to yellow rails (Bookhout 1995). Prairie marshes are vulnerable to draining, grazing, plowing, and haying. Yellow rails are usually sparsely distributed, even in vast expanses of habitat, because they are only found in areas where water depths fall within the narrow suitable range for this species. Because of the variability of water depth within a wetland, as well as seasonal fluctuations, it is important to protect large areas of habitat to ensure that optimal water conditions are present in at least a few locations within a particular wetland. In areas now suitable for yellow rails, fire management might be considered as a means of perpetuating the habitat and preventing succession to more woody vegetation. In addition, manipulation of water levels to ensure a natural flooding cycle is another means of improving habitat quality for yellow rails (Bookhout 1995). Assessing the distribution and population status of yellow rails has been one goal of the Minnesota Biological Survey (MBS). MBS has conducted bird surveys in much of the potential range of yellow rails in Minnesota, resulting in the documentation of more than 140 records of yellow rails in 16 counties from 1987-2008. Breeding season observations were documented by other surveyors in an additional 8 counties over the same time period. Increased knowledge of yellow rails in Minnesota is an important step in their protection in the state. Bookhout, T. A. 1995. Yellow Rail (Coturnicops noveboracensis). Number 139 in A. Poole and F. Gill, editors. The birds of North America. The Birds of North America, Inc., Philadelphia, Pennsylvania. Bookhout, T. A., and J. R. Stenzel. 1987. Habitat and movements of breeding Yellow Rails. Wilson Bulletin 99(3):441-447.